Christmas is a special time of the year at Paultons, meet Santa in his magical Grotto, experience Peppa Pig World in a festive setting and enjoy selected rides and attractions, including Lost Kingdom and Critter Creek, across the Park. Santa's Grotto is available to book 9:30 – 17:15 on selected days throughout November and December. There is limited capacity so book early to avoid disappointment. Park entry is included with your booking, rides and attractions open from 10am (excluding Friday 20th December when the Park will open from 12noon — 7:00pm). 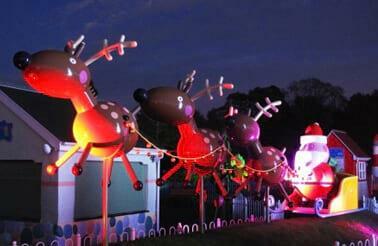 Meet Santa in his magical Grotto and many of his animal friends along the way as they all get ready for Christmas Eve. 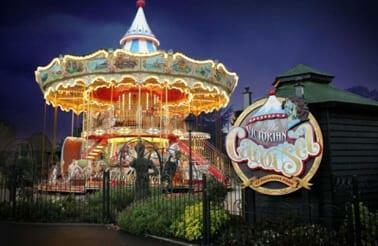 Adorable animated characters greet you at every turn with twinkling lights and magical scenes brought to life. A gift for all children and a festive treat for adults. We take a very special photograph of you and your family when you meet Santa, which is then available to purchase in a festive presentation folder from the Christmas Cabin when you leave the Grotto. 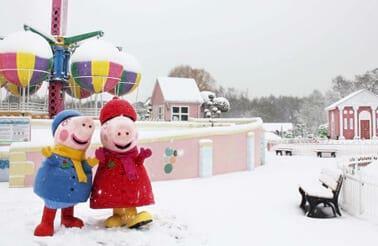 Peppa Pig World at Christmas is transformed with twinkling illuminations, seasonal music and giant Christmas trees. Santa in his sleigh with the reindeer from the series can also be seen; you can also meet Peppa Pig and George in their winter scarves, hats and coats. A Jurassic world where Dinosaurs of all shapes and sizes greet your every turn, an unbelievable prehistoric landscape where you will see, hear, and feel that you have been catapulted back to a long forgotten era. 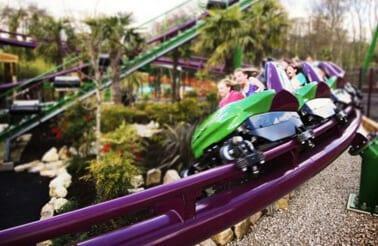 Rides include Flight of the Pterosaur, Velociraptor and Dino Chase coasters, The Boulder Dash and Dino Tour Co. ride! Our spectacular musical Christmas tree stands in the entrance plaza and performs a festive song & light show every 15 minutes. Show Street will be transformed into Snow Street during the Winter season and see the beautiful illuminations in Peppa Pig World. Top tip, head to Peppa Pig World towards the end of the day to see the lights in full glow. See details of planned ride/attraction closures due to maintenance. 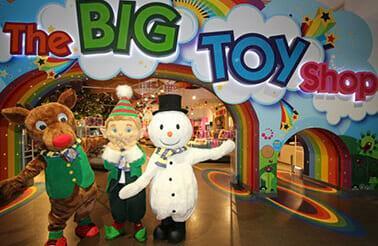 For Christmas gifts and treats visit the Big Toy shop - a shopping adventure like no other. Children enter via their very own twinkling rainbow arch into the enchanted forest where Sparky the giant friendly dragon awaits to greet them. Peppa's Toy Shop in Peppa Pig World is the ultimate store to pick up your Christmas presents with Peppa Pig themed goodies galore! Eat, drink and be merry! 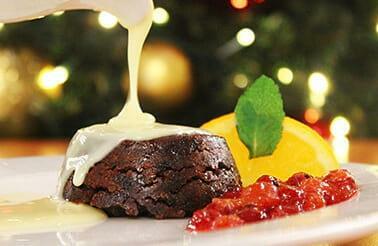 Enjoy a delicious Christmas dinner and pudding cooked and prepared to order in our Wild Forest family restaurant. Stop by the Coffee Station for a delicious hot chocolate or bean to cup coffee, perfect to warm up on a winter's day. Dates and times for the Christmas Season can be seen on our opening times calendar. Rides/attractions open from 10am (excluding Friday 20th December where rides will open from 12noon — 7:00pm) and close from 4:30pm onwards, subject to change due to weather. All visits to the ‘Christmas at Paultons' event which includes entry to Santa’s Grotto, must be pre-booked and pre-paid in advance. Book early to avoid disappointment. If you visit on select dates then you will qualify for a reduced admission rate. Season Ticket holders visiting on select dates qualify for an extra special reduced rate. Season tickets must be valid for the date of your visit in order to qualify for any of the special rates. Reduced rate tickets available for Season Ticket Holders on select dates. Discounted tickets available for one child aged 12 – 35 months per adult season ticket holder. Not available to purchase until November 2019. Individual tickets only, no concessions. Under 1 metre admitted free of charge. Join us at Paultons during our winter opening season (5th November — 23rd December 2019) and enjoy all that the Park has to offer, including Peppa Pig World and Lost Kingdom! 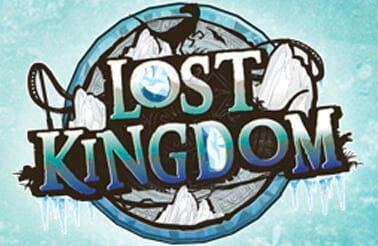 Please note that selected rides and attractions will not be open during the winter opening season. Park Only tickets exclude Santa’s Grotto. Please call 023 8081 4442 for information on prices and to book. 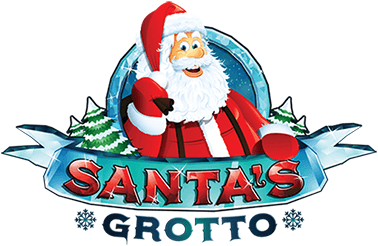 The Santa's Grotto attraction has wide aisles to accommodate guests in wheelchairs, however large electric wheelchairs and mobility scooters are not allowed into the attraction due to reasons of access. We would be happy to provide you with an alternative wheelchair free of charge. Please call to book on 023 8081 4442. Group bookings apply for 20 or more paying people. One Group Organiser is admitted free of charge. A minimum non-refundable deposit of £50 is required for a group booking. Provisional numbers are required when sending your deposit. Please complete and return the Provisional Group Booking Form with your deposit. A provisional booking will be held until 1st November 2019. After this date we reserve the right to offer the spaces elsewhere and we will retain your deposit. Your provisional numbers should be as accurate as possible. If final numbers increase greatly we may not be able to offer the requested day, date or session times. Full payment and exact details of numbers and age of children is required as soon as possible and no later than 1st November 2019. Please double check the ages of the children at the time of the visit before confirming your numbers as tickets can only be altered once issued by paying a £5.00 administration fee. Individual tickets will be issued for every member of the group. The Group Organiser is responsible for issuing the correct tickets to each member of the group before the visit. ONCE TICKETS HAVE BEEN PRINTED ANY ALTERATION WILL INCUR A £5.00 ADMINISTRATION FEE. 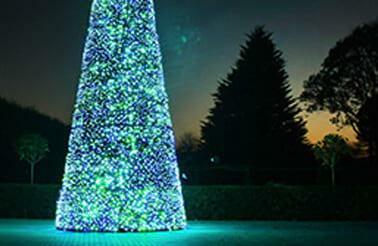 Read Important Information regarding Christmas at Paultons bookings. Peppa Pig © Astley Baker Davies Ltd / Entertainment One Ltd 2003.